Now you see it. Now you don’t. 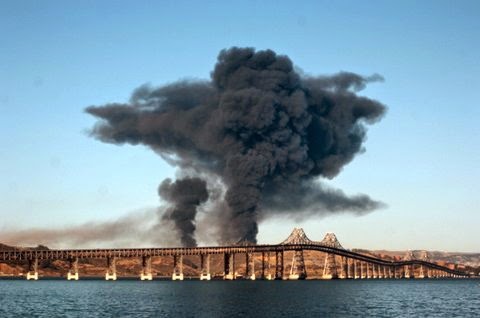 That best describes the Metropolitan Transportation Commission’s estimate of the cost to auto tollpayers of constructing a bike lane on the upper deck on the Richmond-San Rafael Bridge. On Nov. 6, MTC indicated the cost of the job was $68 million. On Feb. 5, the estimate plunged to $29 million. Who knew an alphabet agency could be so efficient? It’s not just that the bureaucrats sharpened their pencils, though there was some of that. Unsurprisingly, there’s an element of smoke and mirrors. The true cost of the bike lane is give-or-take about $47.5 million. Even if the revised $29 million estimate was accurate, which it’s not, that’s still an appalling expenditure for a bike lane across a five-mile windy span few will use. Accounting tricks aren’t new. A tried-and-true maneuver to lower apparent costs is shifting figures to other accounts. The Nov. 5 bikeway estimate included $15 million to replace bike access on the bridge’s east side approach from Point Molate to Richmond. That $15 million hasn’t gone away. It’s just missing from the Feb. 5 bikeway numbers. MTC’s excuse is that since there’s technically bike access to the bridge from Richmond, replacing it with improved bike access should be treated as an auto-related expense. That contention is pure spin. There’s a sign on Interstate 580 saying bikes may use the route, but few dare to do so. A new bike route would surely be an improvement for cyclists, but its cost has little to do with restoring the Richmond bridge’s third auto lane. If bikes are kept on the highway’s shoulder as at present, costs are negligible. If an enhanced bikeway is desired, place the cost where it belongs: on the new transbay bike lane. It’s all just an accounting device to make the bridge bikeway easier for a dubious public to tolerate. MTC now optimistically contends the link can be built more cheaply, but I’m dubious. Add that $15 million back in and the transbay bikeway cost rises to $44 million. The February estimate includes $13 million for long-term operational costs assuming a movable upper deck auto-bike barrier is moved daily. This cost evaporates when it turns out that the barrier needs to be moved only “for specific Caltrans maintenance activities,” possibly four to six times a year. This is what happens when the powers-that-be want to sell a concept. They’re forced to think about reality. If it’s true the bike barrier needs to be moved only bimonthly, Caltrans needs to revise its planned utilization of the restored third auto lane to keep it open continuously. Right now, it is saying it can be used only during weekday evening peak travel hours. Otherwise it’ll be closed for pressing maintenance needs. Oddly, its access concerns evaporate when bikeways are involved. Instead of reducing the cost of occasionally moving the bike-auto barrier, including rental of a zipper truck to move the barrier, it goes to zero with Caltrans’ budget absorbing all costs. Adding back $1 million to move the barrier over five years brings the total to $45 million. By magic, the initial budget’s $10 million inflation-related escalation cost disappears. We’re told MTC forgot to consider anti-inflationary effects of the Great Recession. The return of relative prosperity goes unmentioned. Prudence adds 5 percent or $2.5 million for inflation, bringing the total to a realistic $47.5 million. While the initial $68 million estimate was too high, the $29 million cost currently touted by MTC and Caltrans is too low. The bridge bikeway’s true cost is in the range of $45 million to $50 million.